You have a great article that offers insights or solutions for readers. So what? Scores of other authors in your niche do too. What makes you and your article unique? What’s your Unique Value Proposition (UVP)? A UVP is a promise of value that’s exclusively delivered by you. In sales, this is a promise that a product or service is the best because it over delivers in a more effective and cheaper manner than anything else in its class. In article writing, the same is true. With an effective UVP, you promise your readers value. Once you’ve delivered your promise, your readers will know you as a trustworthy and credible source who’s worth following. Who’s your target audience and what’s their most pressing need or want? What’s the number one benefit you provide to your target audience? Can you describe how this benefit solves your target audience’s need or want? What’s unique about your benefit – what do you offer that no one else has or can? Next, can you answer all of the above questions (combined) in 2-3 lines? It’s tough, but that’s where a little creativity, practice, refinement, and the following tips come along. What’s your brand identity and your strengths? Even if you choose to not answer these questions in depth, answer them. Knowing who you are, what you represent, as well as what you offer will guide your efforts to success. Get audience feedback. Nothing is more sobering than discovering the brand you’re trying to project is failing to meet the expectations of your audience. Get feedback to find out what actually is drawing your audience to your platform, why they stay (or leave), and more. Use this to continue molding your UVP. Look for opportunities. What’s missing for your audience? What void in their needs and wants can you fill with your strengths? Invent and reinvent yourself by searching trends and patterns in your niche that will help you build a unique position. You have a great article that offers insights or solutions for readers. So what? What makes you and your article unique? You do have incredible, unique insight to share! Use the tips above to create an effective UVP. What tips and strategies can you add to developing your UVP? Are there any other strategic measures you take in targeting your audience with great value? Please share your comments or questions in the section below – we’d love to hear from you! Without uniqueness in each article, by way of content and style, your article or blog cannot attract repeated visits of readers. Thank you EzineArticles for this timely article. It is spot on as it helps to hone in on a project that I’m working on. The tips you shared allows me to stay on course in defining mission/vision and the the elements described in your article. 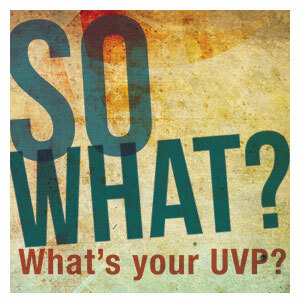 I didn’t know about uvp until I read your article. What I have discovered is that there are aspects of uvp that I’m already practising and others I have to work on. Thanks for this great post. I think the best answer to a UVP lies within the realm of niche marketing. If you’re operating in a large market – you will probably sound like everybody else in the market. But in a small niche, creating a UVP is simple and easy – and people will understand it instantly because you have a “valuable” solution that can benefit their lives. How does one get feedback from her article readers? You will get feedback from other blogs by building relationship. Give feedback to sites you have interest in and welcome comments from others. Having a UVP is absolutely vital to your article writing success online. This is something I’ve got better at identifying throughout my writing career. Something we all need to focus on better. Getting your UVP right and holding to it is like finding the right path in doing anything in life. All articles written by the writer, with that in mind, indeed makes him (the writer) fulfill the ultimate in the writing profession! There are a few ways to get feedback from your readers. The first is to review any comments that your readers leave for you on your articles. Next, review any comments received on your website/blog. If you have members subscribe to a newsletter it’s important to include an area where they can provide a cancellation reason if they choose to unsubscribe. Then, gather all of this feedback and use it to drive further growth! In the age of fierce competition only the unique and outstanding performer is going to survive and stable. There are two ways one can become unique… The first create your own path and style instead of blindly following others. Second, give, give and give.. If you are a credible man and have been giving values to your readers, followers the are going to learn from you the moment you give them something new.. believe it you will hold special place in their heart. A Nice theme of this article makes for reading a worthy time. Great information! I will keep this in mind when I write my next article. I am learning so much from you! This post was especially helpful. Thanks!